The ADA Restroom Trailer + 10 Station Maui Series features a designer two tone gray interior with all the amenities of home. This unit contains a men’s and women’s suite, and unisex ADA suite. Interior features of the men’s and women’s suites feature china pedal flush toilets, double vanities with floating countertops, shatter proof framed mirrors, and abundant interior lighting. While the women’s suite holds 5 stalls with 3/4 length privacy doors, the men’s suite has 2 urinals with privacy dividers and 3 stalls with 3/4 length privacy doors. The ADA suite includes ADA toilet, sink, framed mirror, and grab rails. The ADA suite lowers to the ground with the push of a button, and also includes a fold up ramp on rear for wheelchair access. This suite also allows for a full 360 turning radius for wheelchairs and additional assistance grab rails. 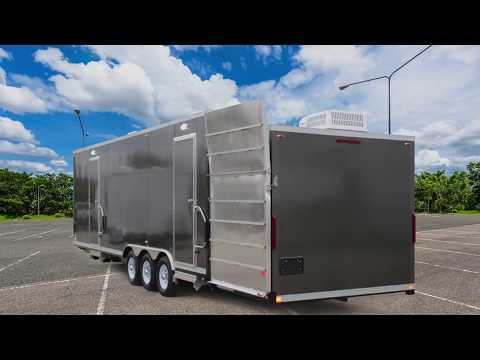 This ADA Restroom Trailer is climate controlled with A/C and heat strips, and features abundant exterior lighting, for safe entry/exit, and time of the day or night. Smarter Restrooms App - An interactive tool allowing portable restroom rentals fleet owners to monitor and control operational systems for their trailer(s) from any smartphone, tablet, or computer. You can easily maintain systems operations with the ability to monitor waste and freshwater tank levels, power, and interior climate control.